With blinding blizzards come threats of the Yeti aka Abominable Snowman wandering in with the weather they love. In the summer they reside near the Arctic Circle but during winter they make their way down south as far as the northern United States although they go further by traveling through the high altitude mountain ranges such as the Rockies. They also often stay within winter storms and travel with them across North America. They are deadly dangerous beasts who are nothing like their docile cousins, the Sasquatch aka Big Foot. They are a comparable size to Sasquatches weighing in at approximately 600-800 pounds and reaching heights of 8-9 feet tall. Where as Big Foot has brown to black fur, the Yeti has bright snow white fur which can make it deceptively blend in with any winter environment. For this reason it’s advised to cease all winter activities that take you into remote wooded areas or open fields. Even a frozen lake or pond isn’t safe as they often use thin ice as traps. They are somewhat more intelligent than Sasquatch and know how to set simple boobie traps which involve holes in the ground, snow or ice. Although hiding in a pile of snow and bursting out as you come past is their standard method of capturing prey. They are quite devious and should never be underestimated. If you spot one we recommend running as fast as you can. Luckily they run pretty slow compared to the average humans top running speed. Although their stride is very long and they are naturally built to traverse through deep snow. Once they have the sight or scent of their prey they will tirelessly pursue them for hours without resting. When at the Arctic Circle in the summer they prey on a variety of Arctic animals including arctic wolves and caribou. They will also wade into cold water to hunt for various water animals whether it be fresh water or the sea. The only beast it won’t take on is a polar bear. Both beasts have a respect for each other and will only attack over a territory dispute. Once the Yeti begins his trek south in the autumn, he yearns for human flesh. The Yeti actively hunts humans in remote snow ridden regions although it will go anywhere within the cloak of a blinding blizzard. Even a city might not be safe in this case. Unlike American Indians and their friendship with Sasquatch, the Eskimos consider the Abominable Snowman to be their mortal enemy. 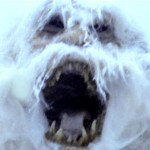 Indeed Yeti attack is a very real danger for the igloo living indigenous peoples of the great north. Most Eskimos have their igloos blessed by a Shaman so they can be safe havens in which the Yeti cannot enter. Yeti fur is believed to contain mystical properties and is used in a variety of magical spells and rituals particularly among the Eskimo people. Some Eskimo High Priests wear Yeti fur coats which grants them mystical protections from the great beasts. These magical coats are usually passed down through the generations as a Yeti kill is rare. Especially considering their great strength, prowess, cunning, super healing abilities and immortality. The only way to kill a Yeti is through beheading or incineration by fire. If you would like to protect your home during these long cold winter months then please contact us at Mystic Investigations or find your nearest Eskimo Shaman, High Priest, or Witch Doctor. This entry was posted in Abominable Snowman, Winter, Yeti. Bookmark the permalink. Pingback: Ask Mystic Investigations What Causes Snow Rollers?